Animated Films are ones in which individual drawings, paintings, or illustrations are photographed frame by frame (stop-frame cinematography). Usually, each frame differs slightly from the one preceding it, giving the illusion of movement when frames are projected in rapid succession at 24 frames per second. The earliest cinema animation was composed of frame-by-frame, hand-drawn images. When combined with movement, the illustrator's two-dimensional static art came alive and created pure and imaginative cinematic images - animals and other inanimate objects could become evil villains or heroes. Animations are not a strictly-defined genre category, but rather a film technique, although they often contain genre-like elements. Animation, fairy tales, and stop-motion films often appeal to children, but it would marginalize animations to view them only as "children's entertainment." Animated films are often directed to, or appeal most to children, but easily can be enjoyed by all. See section on children's-family films. Also see this website's related sections on Pixar-Disney Animations, Visual and Special Effects Milestones in Cinematic History as well as AFI's 10 Top 10 - The Top 10 Animated Films. To create the animations, individually-created images were painted directly onto the frames of a flexible strip of transparent gelatine (with film perforations on the edges), and run through his projection system. Depending upon one's definition of terms, some consider Pauvre Pierrot the oldest-surviving animated film ever made and publically broadcast. The predecessor of early film animation was the newspaper comic strips of the 1890s, in which each cartoon box was similar to a film frame. Some of the earliest animated films used very primitive stop-motion techniques (known as 'stop-trick' or 'substitution splice'), when a single change was made to an object between two shots. This early technique has been termed stop-motion substitution or stop-action. Pioneering animators, directors, and filmmakers Albert E. Smith and newspaper cartoonist James Stuart Blackton, both co-founders of the Vitagraph Company, created The Humpty Dumpty Circus (1898), a presumed lost film. This theatrical 'cartoon' from Vitagraph, a lost silent film, was claimed by Guinness to be "the first animated film using the stop-motion technique to give the illusion of movement to inanimate objects." And in Arthur Melbourne Cooper's public service announcement Matches: An Appeal (1899, UK), animation was achieved by stop-trick images of moving matchsticks. One matchstick wrote an appeal on a blackboard, requesting that Britishers send matches (which were once somewhat expensive) to soldiers fighting in the Boer War. Newspaper cartoonist J. Stuart Blackton also produced the live-action The Enchanted Drawing (1900), a Vitagraph Studios short film that featured a drawn character and some objects. It contained one of the earliest surviving prototypes of stop-action animation (non continuous frame-by-frame filming). In one of the earliest sequences of 'trick' animation, it showed a chalk-talk artist (Blackton himself) using a large stand-up easel on which he drew a round cartoon face of an elderly man. He then sketched a bottle of wine and a glass goblet in the upper-right hand corner of the page - and then removed the two items from the sketch paper, holding them up as real 3-D objects and pouring himself a glass of wine. He did the same with the man's hat and cigar. At the conclusion of the short segment, he then restored all the elements back into the picture. In Edwin S. Porter's Fun in a Bakery Shop (1902), the Edison director molded clay sculptures and filmed with stop-action animation, thereby creating the first known primitive example of stop-motion clay animation. The 80-second film was a combination of stop-action photography and "trick" object manipulation. In the short utilizing a technique known as "lightning sculpting," a baker's assistant sculpted dough thrown onto the side of a flour barrel, making various faces and comical shapes - executed with smooth edits between stop-camera "freezes." A more ambitious breakthrough in the step-crank process (frame-by-frame animation, the precursor of stop-motion) was in Segundo de Chomón's comedy-fantasy short for Pathe Frères films, titled The Electric Hotel (1905, Sp.) (aka El Hotel Electrico). It was released in the US in 1908. It was a trick film similar to the films of Georges Melies (hence, Chomon was dubbed "the Spanish Melies"). [Note: He was also credited with developing "the dolly" (a camera on rails that 'traveled' for tracking shots).] The two characters in the short were the director and his wife Julienne Mathieu, who played couple Bertrand and Laure arriving at a totally-automated hotel. Once the two checked in, their luggage went into motion and completely unpacked itself upstairs. Electrical switches in their room automatically performed various tasks: shoe-brushing and shining, hair-combing and beard-shaving, and letter-writing. But then in its cautionary ending about modern technology, the machinery behind all of the hotel's automation malfunctioned when a control room technician pulled the wrong lever, and everything was chaotically jumbled in their hotel room. Historically and technically, the first animated film (in other words, the earliest animated film ever printed on standard motion-picture film) was Humorous Phases of Funny Faces (1906), also made by J. Stuart Blackton. It was the earliest surviving example of a drawn animated film. It was the first cartoon to use the single frame method, and was projected at 20 frames per second. In the film, a cartoonist's line drawings of two faces were 'animated' (or came to life) on a blackboard. The two faces smiled and winked, and the cigar-smoking man blew smoke in the lady's face; also, a circus clown led a small dog to jump through a hoop. Also, Blackton's stop-motion The Haunted Hotel (1907) was one of the first examples of animation (stop-motion mixed with live-action) that became exceedingly well-known. Its main sequence of objects coming to life on a rural country inn's dinner table baffled viewers (and the bewildered, long-nosed main character!) as to how the special effect was accomplished. This was soon followed by the first fully-animated film (without live action) - Emile Cohl's Fantasmagorie (1908, Fr. ), using traditional animation techniques. It consisted solely of simple line drawings (of a clown-like stick figure) that blended, transformed or fluidly morphed from one image into another. New York Herald comic-strip animator and sketch artist Winsor McCay (1869-1934) produced a string of comic strips from 1904-1911, his three best being Dreams of the Rarebit Fiend, Little Sammy Sneeze, and Little Nemo in Slumberland (from October 15, 1905 to July 23, 1911). Although McCay wasn't the first to create a cartoon animation, he nonetheless helped to define the new industry. He was the first to establish the technical method of animating graphics. His first animation attempt used the popular characters from his comic strip (and became part of his own vaudeville act): Little Nemo in Slumberland (1911) (with 4,000 hand-drawn frames), followed by How a Mosquito Operates (1912) (with 6,000 frames). His first prominent, successful and realistic cartoon character or star was a brontosaurus named Gertie in Gertie the Dinosaur (1914) (with 10,000 drawings, backgrounds included), again presented as part of his act. In fact, McCay created the "interactive" illusion of walking into the animation by first disappearing behind the screen, reappearing on-screen!, stepping on Gertie's mouth, and then climbing onto Gertie's back for a ride - an astonishing feat! It was the earliest example of combined 'live action' and animation, and the first "interactive" animated cartoon. Some consider it the first successful, fully animated cartoon - it premiered in February 1914 at the Palace Theatre in Chicago. McCay's 12-minute propagandistic, documentary-style The Sinking of the Lusitania (1918), an animation landmark, was the first serious re-enactment of an historical event - the torpedoing of the RMS Lusitania by a German U-boat on May 7, 1915, resulting in the loss of almost 2,000 passengers. It was one of the earliest films to utilize cel animation. Soviet animator (W)ladislaw Starewicz created the first 3-D, stop-motion narratives in two early films with animated insects: The Grasshopper and the Ant (1911) and The Cameraman's Revenge (1911). And John Randolph Bray's first animated film, The Artist's Dream(s) (1913) (aka The Dachshund and the Sausage), the first animated cartoon made in the U.S. by modern techniques was the first to use 'cels' - transparent drawings laid over a fixed background. The first animated character that attained superstar status (and was anthropomorphic) during the silent era was the mischievous Felix the Cat, in the studios of Pat Sullivan, Felix's character cartoon owner. Supposedly, Felix was inspired by Rudyard Kipling's "The Cat That Walked By Himself" in the Just So Stories for Little Children published in 1902. Felix was not the most lucrative of the silent animated cartoon series, nor the longest-running, and did not come from a major studio. Felix was the first unique and original animated star to be created specifically for the screen - he wasn't derived from the comics or some other source, although he retained remarkable similarities to Charlie Chaplin's "Little Tramp." Felix originated in Pat Sullivan's studio (Sullivan took all the credit), but was drawn and designed by young animator Otto Messmer. For the first few years from 1919 to 1921, the Felix cartoons (25 of them) were distributed as shorts by Paramount Pictures, and then by Margaret J. Winkler (64 films from 1922-1925), the first female to produce and distribute animated films. From 1925 to 1928 (a total of 78 cartoons), distribution was handled by Educational Pictures, a film distribution company, and then First National Pictures took over distribution from 1928–1929. The characer didn't start out as "Felix." The (unnamed) cat's first two cartoons, when Felix was known only as "Master Tom" (and was a resident of Pussyville) were Feline Follies (1919) (Felix's debut short film) and Musical Mews (1919), considered lost. Both films were Paramount Screen Magazine cartoons, a semi-weekly compilation of short film segments that included animated cartoons. Initially a one-shot character, Felix was included with two other cartoons as part of the Paramount Screen Magazine program, so there were no ending titles. By the third Felix cartoon, The Adventures of Felix (1919), Felix took his permanent name. The character instantly became popular and his own stand-alone cartoon series was immediately launched. Messmer directed and animated more than 150 Felix cartoons in the years 1919 through 1929. Felix in Hollywood (1923) was notable as the first (or earliest) animated cartoon to feature cameos and caricatures of Hollywood celebrities (Felix appeared alongside Douglas Fairbanks, Charlie Chaplin, Gloria Swanson, Ben Turpin, William S. Hart, and even film censor William Hays and director Cecil B. DeMille). At the same time, Messmer (and others) started a Felix comic strip in 1923 (debuting in England's Daily Sketch on August 1, 1923) that was soon distributed in the US by King Features Syndicate - the strip continued in various forms until 1966. Felix was the first character to be so ubiquitous and widely merchandised - in syndicated comic strips, songs, and consumer products. Originally, Felix appeared as an angular, snout-nosed cartoonish fox, but by 1924, Felix's appearance (by animator Bill Nolan) was made rounder and cuter, more smooth-moving and wide-eyed, as seen in Felix the Cat Trips Thru Toyland (1925), and one of his last big cartoons was Felix in Jungles Bungles (1928). The last Felix the Cat silent cartoon distributed by Educational Pictures was The Last Life (1928), at the time of the advent of the talkies and the success of Walt Disney's Mickey Mouse. In Gollywog Land (1912, UK) - a lost film Some sources claim that the Natural Colour Kinematograph Company's In Gollywog Land (1912, UK), a lost film, was the earliest color animation, using Kinemacolor (a two-color process). It was essentially a live-action film with puppet-animated sequences. The Debut of Thomas Cat (1920) (aka The Debut of Thomas Katt) - a lost film Producer John Randolph Bray's (and Bray Picture Corporation's) The Debut of Thomas Cat (1920) (aka The Debut of Thomas Katt) has often been credited as the first color cartoon made in the US, using the expensive Brewster Natural Color Process (a two-emulsion subtractive color process), an unsuccessful precursor of Technicolor. It was the first animated short genuinely made in color using color film. Drawings were made on transparent celluloid and painted on the reverse, then photographed with a two-color camera. Pinto’s Prizma Comedy Revue (1919) - a lost film Another contender for the world's first color cartoon was Vance DeBar "Pinto" Colvig's self-produced Pinto’s Prizma Comedy Revue (1919), made with the two-color Prizma color system. Fiddlesticks (1930) MGM's and ex-Disney animator Ub Iwerks' debut short Fiddlesticks (1930) was the first animated film released using the two-strip Technicolor process. It was notable as the first Flip the Frog cartoon for MGM, and one of only two made in color. It was also the first complete animated short to combine color and synchronized sound. The little-known but pioneering, oldest-surviving feature-length animated film that can be verified (with puppet, paper cut-out silhouette animation techniques and color tinting) was released by German film-maker and avante-garde artist Lotte Reiniger, The Adventures of Prince Achmed (aka Die Abenteuer des Prinzen Achmed) (1926, Germ. ), based on the stories from the Arabian Nights. Reiniger's achievement is often brushed aside, due to the fact that the animations were silhouetted, used paper cut-outs, and they were done in Germany. And the rarely-seen prints that exist have lost much of their original quality. However, the film was very innovative -- it used multi-plane camera techniques and experimented with wax and sand on the film stock. A classic animator in the early days of cinema was Walt Disney, originally an advertising cartoonist at the Kansas City Film Ad Company, who initially experimented with combining animated and live-action films. The very first films were made by him (and other animators) at his own animation studio in Kansas City (Missouri), known as the Laugh-O-Gram Studios. Among his employees were several pioneers of animation: Ub Iwerks, Hugh Harman, Rudolf Ising, Carmen Maxwell, and Friz Freleng. They created short cartoons (live-action with some animation) - obviously named Laugh-O-Grams, such as Little Red Riding Hood (1922) - the first "real" Walt Disney cartoon, followed by The Four Musicians of Bremen (1922). The cartoons were shown in Kansas City's Newman Theatres. There were seven original Laugh-O-Grams fairy tales in 1922, all of which have survived. While still at the failing Laugh-O-Gram Studios, Disney's staff made the first Alice Comedy, a one-reel (ten-minute) short subject pilot titled Alice's Wonderland (1923). Disney's Alice cartoons placed a live-action title character (Alice) into an animated Wonderland world. After bankruptcy in 1923, Disney was forced to relocate and set up his own studio in Los Angeles (the Disney Brothers Studio). He continued his work on the Alice Comedies (or Alice in Cartoonland). These were Disney's first successful silent live-action/animated cartoons (from 1923-1927) - a series of shorts (composed of 56 episodes) that continued with Alice's Day at Sea (1924). Soon after, Oswald the Lucky Rabbit (designed by Disney's chief animator Ub Iwerks) became Disney's first successful animal mascot or star in a cartoon series distributed by Universal. It was Disney's third animated series, following the Laugh-O-Grams and Alice Comedies (see above), when he was forced to compete with Felix the Cat and Koko the Clown. Oswald appeared in 27 silent, black and white cartoon shorts (from 1927-1928 for Universal Studios), such as Poor Papa (1927) (Oswald's debut pilot film, but not released until 1928), and Trolley Troubles (1927) (the first official released short, but produced second). Oswald was also the first Disney character to be merchandized. 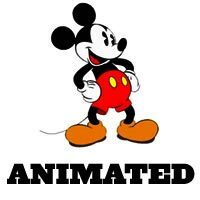 In 1928, Disney was forced to give up the character of Oswald to George Winkler Productions, and then to Universal and the Walter Lantz Studios, where another up-and-coming animator Tex Avery was working (see more on Avery later). Oswald the Lucky Rabbit's first sound cartoon was Hen Fruit (1929) (a lost film), while the first Oswald short produced by Walter Lantz/Universal was Race Riot (1929). The first Mickey Mouse cartoon to be released (as a pilot test screening only on May 15, 1928) was Plane Crazy (1928), in which Mickey (without his trademark shoes or gloves), while impressing Minnie, imitated aviator Charles Lindbergh. The second was Steamboat Willie (1928) (first released as a silent film on a limited basis on July 29, 1928), with Mickey as a roustabout on Pegleg Pete's river steamer, again without his trademark white gloves. The third was The Gallopin' Gaucho (1928) (although the second film to be produced) with a silent version completed on August 2, 1928 (but not released until after Steamboat Willie). And the fourth was The Barn Dance (1929), first released on March 14, 1929. To help make Mickey stand out from other cartoon characters at the dawn of the talkies, the 7-minute Steamboat Willie (1928) was re-released in a sound version - it was the first cartoon with post-produced synchronized soundtrack (of music, dialogue, and sound effects) and is considered Mickey Mouse's screen debut performance and birthdate. Animated star Mickey (with Minnie) was redrawn with shoes and white, four-fingered gloves. [The character was a take-off based upon Buster Keaton's Steamboat Bill (1928). ] It was a landmark film and a big hit - the first sound cartoon to be a major hit - leading to many more Mickey Mouse films during the late 1920s and 1930s. Strangely, Mickey's first sound cartoon didn't include Mickey's voice -- he didn't speak until his ninth short, The Karnival Kid (1929) when he said the words: "Hot dogs!" [Note: Walt's voice was used for Mickey.] Walt Disney was fast becoming the most influential pioneer in the field of character-based cel animation, through his shrewd oversight of production. Dinner Time (1928) At about the same time, the first publically-shown 'synchronized' sound-on-film cartoon released theatrically was Dinner Time (1928). The cartoon was directed by Paul Terry - his first sound cartoon for Fables Studios, as part of an Aesop's Film Fables series. It was notable for being among the first cartoons produced and released as a sound cartoon, using the RCA Photophone sound system. The cartoon was produced (and also premiered on September 1, 1928 in NYC) before Disney’s Steamboat Willie (1928), although it was soon overshadowed by Disney's release. At the same time, serious rivals to Disney's animation production came from the Fleischers (Max, Dave, Joe, and Lou). They were already making technical innovations that would revolutionize the art of animation. In 1915, Max Fleischer invented the rotoscope (patented in 1917) to streamline the frame-by-frame copying process - it was a device used to overlay drawings on live-action film. The Fleischers were also pioneering the use of 3-D animation landscapes, and they produced two versions of The Einstein Theory of Relativity (1923) - a 20-minute documentary short, and a 50-minute feature-length educational version - often considered the first documentary feature-length animation. Another Fleischer exploration of scientific theory (using film and animation) in the same year was Evolution (1923) (aka Darwin's Theory of Evolution). In 1919, one of the Fleischers' first successful ventures was the premiere of the part live-action/part animation Out of the Inkwell series of shorts, featuring their animated Ko-Ko the Clown character in a live-action world - one of the first animated characters. One of their early animation series, featuring Ko-Ko the Clown, was composed of almost 50 short, 3-4 minute films called Ko-Ko Song Car-Tunes (1924-1927). The Ko-Ko Song Car-Tunes were the first animated films (cartoons), some of which featured a synchronized soundtrack (they were the first animated films with sound) - the precursors to karaoke, that used the Lee DeForest Phonofilm 'sound-on-film' process. Reportedly, 19 Song Car-Tunes utilized the Phonofilm sound system (some were first released in a silent version, and then with sound). 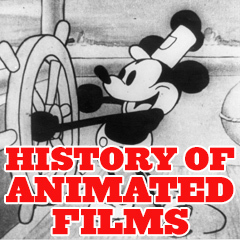 They were the first talking cartoons - even pre-dating Disney's Steamboat Willie (1928) by a number of years. In total, there were 49 Car-Tune animations. Some were first released as silents, then with sound (noted in red below). The songs in the series ranged from contemporary tunes to old-time favorites. These were the first audience participation films, with sing-along lyrics and a 'bouncing-ball' helper. The gimmick was a bouncing ball atop the lyrics on screen, to help audiences follow along with the song. Ko-Ko the Clown continued to be their star performer, who often climbed out of an inkwell at the start of each cartoon. One of the first Car-Tune cartoons was Oh, Mabel (1924), that began with Ko-Ko the Clown jumping out of an inkwell and running through a few hijinks before the song Oh, Mabel. My Bonnie Lies Over the Ocean (1925) was reportedly the first cartoon to use the bouncing ball with the lyrics of a song. In My Old Kentucky Home (1926, 1928), the earliest Car-Tune to synchronize the animation with sound, Bimbo spoke to the audience: "Follow the ball and join in everybody." Come Take A Trip in My Airship (released first as a silent film in 1924 and then with sound in 1925 (in the Song Car-Tune Series) and in 1930 (in Fleischer's Screen Songs Series)), acc. to the Guinness Book of Movie Facts and Feats, was the "first cartoon talkie for theatrical release." In Tramp, Tramp, Tramp - The Boys Are Marching (1926, 1928), Ko-Ko held up a sign encouraging the audience in a theatre to "watch the bouncing ball" and sing: "Tramp, Tramp, Tramp." Come Take a Trip in My Airship (1924, 1925, 1930) The Bouncing Ball Moving Above Lyrics Bimbo: "Follow the Ball and Join in Everybody"
Ko-Ko's last silent film was Chemical Koko (1929). As with Felix the Cat, the advent of sound seemed to doom Ko-Ko (although he reappeared in the early 1930s). In 1929, Max Fleischer started a new studio on Long Island, named Fleischer Studios, while still in a relationship with Paramount. The Fleischers launched a new series from 1929 to 1932 called Talkartoons that featured their smart-talking, singing dog-like character named Bimbo. Although Bimbo quickly became a star, and sometimes appeared with a revitalized Ko-Ko the Clown in a supporting role (Ko-Ko last appeared in the Betty Boop talkie cartoon Ha! Ha! Ha! (1934)), Bimbo was soon relegated to a minor co-starring role with the Fleischer's next racy headlining cartoon star, Betty Boop. Max Fleischer was responsible for the provocative, adult-oriented, cartoon Betty Boop vamp-character, who always wore a strapless, thigh-high gown (and visible garter on her left thigh) and was based on Jazz era singer Helen Kane (although some claimed she resembled flapper icon Clara Bow's 'It' Girl and Mae West). A prototype of the squeaky- and baby-voiced cartoon queen (voiced for most of the 30s by Mae Questel) was introduced in the 7th Bimbo Talkartoon entitled Dizzy Dishes (1930) - with her appearing un-named as a long-eared puppy dog! She also appeared (again with dog ears) in Talkartoon's and Fleischer's Mysterious Mose (1930) (the cartoon was slightly risque - while shivering with fright, Betty's nightgown jumped up off her body, and when a mysterious figure appeared under a blanket next to her in bed, she rubbed its belly to see if it was real). In the early cartoon Betty Co-Ed (1931), she was called Betty, and in another pre-Code Bimbo cartoon entitled Silly Scandals (1931) (the title spoofed Disney's Silly Symphonies), she was named Betty Boop for the first time but still with puppy dog ears - she sang You're Driving Me Crazy (from the musical comedy Smiles (1930)) while her dress top kept falling down to reveal her lacy bra. In Talkartoons' Any Rags (1932), she was transformed into a human after losing her floppy dog ears (they became hoop earrings), and her nose became button-shaped and flesh-colored. In Stopping the Show (1932), she appeared under her own credits banner for the first time (she had previously appeared only in Talkartoons and Screen Songs). Unfortunately, the cute, titillating 'boop-oop-a-doop' Betty with an exposed garter and strapless frock was destined to be censored with the advent of the enforceable, conservative and puritanical Hays Production Code in 1934. The Betty Boop cartoons were stripped of sexual innuendo and her skimpy dresses, and she became more family-friendly. As a result of the drastic changes to her character after 1934, her popularity declined, and her demise came with her last cartoon appearance in Rhythm on the Reservation (1939) - often criticized for its potentially offensive Native-American characterizations. The last official Betty Boop cartoon released was Yip Yip-Yippy (1939), without Betty Boop in it. The Fleischers also obtained the rights to the tough, one-eyed, spinach-loving sailor Popeye with over-sized arms (who was introduced in mid-January 1929 in creator Elzie C. Segar's "Thimble Theatre" newspaper comic strip published in the New York Journal for King Features Syndicate, in its 10th year since 1919). Popeye became so popular in the comic strip that it was renamed "Thimble Theatre, Starring Popeye." In 1933, Max Fleischer adapted the Thimble Theatre characters into a series of Popeye the Sailor theatrical cartoon shorts for Paramount Pictures. The voices of Olive Oyl, Popeye's whiny girlfriend, and Sweet Pea were provided by Mae Questel. The character Wimpy provided the name for an unpopular type of British hamburger. By 1938, Popeye had replaced Mickey Mouse as the most popular cartoon character in America. Paramount's Famous Studios continued the series beginning in 1942, and Popeye's movie career lasted until 1957. Robert Altman directed the live-action film flop, Popeye (1980), starring Robin Williams as Popeye, Shelley Duvall as Olive Oyl, and Ray Walston as Pappy, Popeye's father. Dave and Max Fleischer, in an agreement with Paramount and DC Comics, also produced a series of seventeen expensive Superman cartoons in the early 1940s. 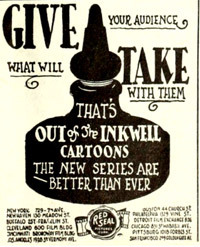 The high-budgeted films were at $100,000 an episode, about four times the average price of comparative cartoons. The first 10 minute Superman short, Superman (1941), which premiered in 1941, introduced the narrator's exclamations of "faster than a speeding bullet, more powerful than a locomotive, able to leap tall buildings in a single bound!" It was nominated for the Academy Award for Best Animated Short Subject, but lost to Disney's Lend a Paw (1941). The most famous of the series was the second entry, The Mechanical Monsters (1941) with the super-hero battling giant flying robots. It also included a redesigned, more sensual Lois Lane and marked the first time that Superman would change into his classic red and blue costume in a telephone booth. It was also the only time that Superman was shown using X-ray Vision in a Fleischer short. Also notable was The Bulleteers (1942), the fifth entry of the 17 shorts. In the story, the Daily Planet's Clark Kent/Superman battled and eliminated a gang in Metropolis known as The Bulleteers - named after their bullet-shaped rocket car. As a final footnote, the struggling and insolvent Fleischer Studios was acquired by Paramount Pictures in 1942. The studio was restructured and renamed Famous Studios, and returned to New York after being in Florida since 1938. Work continued on the Popeye and Superman series. The studio also produced cartoons based on Harvey Comics characters, including over two dozen Little Lulu (Moppet) cartoons in the 40s, and over 50 Casper the Friendly Ghost cartoons that stretched into the 1950s (Casper made his debut in Izzy Sparber's cartoon short The Friendly Ghost (1945)).